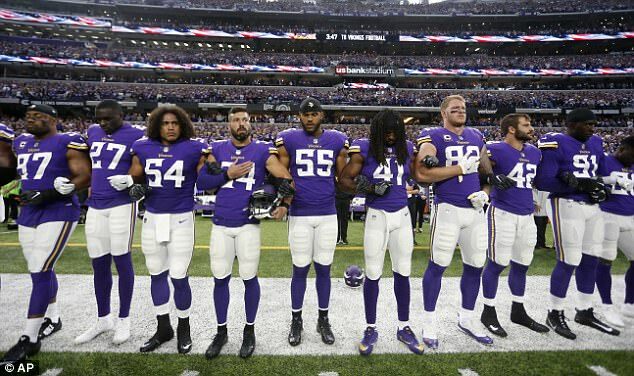 NFL players have continued to kneel while others raised their fists in protest during the national anthem for a second straight week as they defied a fresh demand from President Donald Trump to stand. 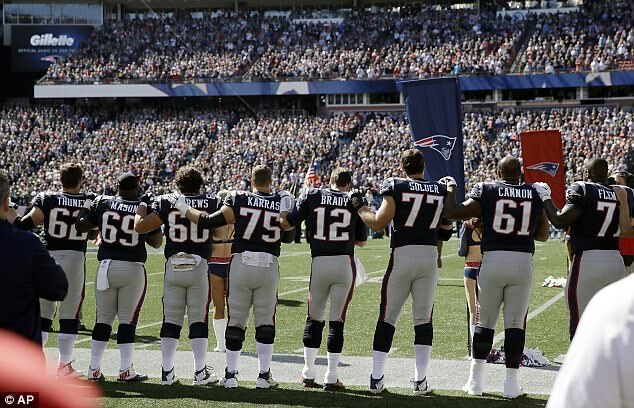 A week after more than 100 players took to their knees during the The Star-Spangled Banner, smaller protests could be seen as the NFL games kicked off on Sunday. 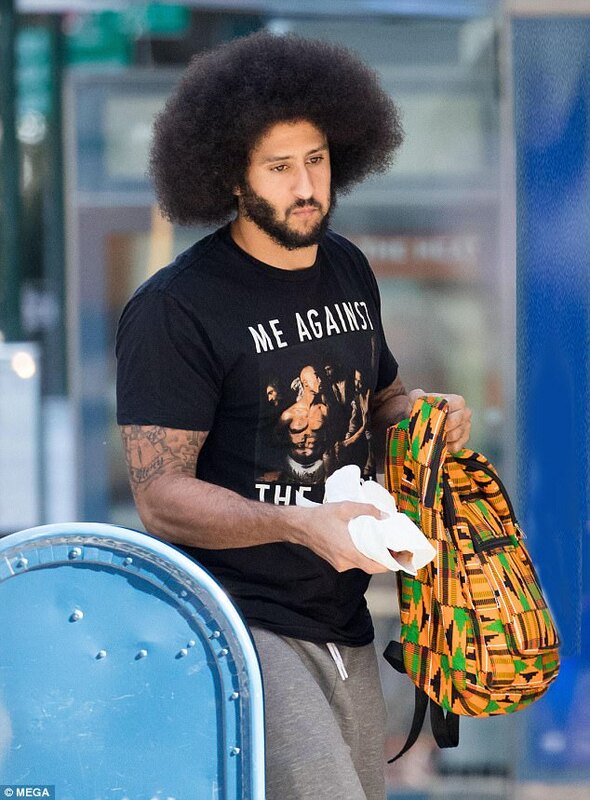 The protests came as free-agent Colin Kaepernick – who is credited with starting the kneeling trend last year – was spotted strolling around New York on Sunday morning wearing a ‘Me Against The World’ t-shirt. 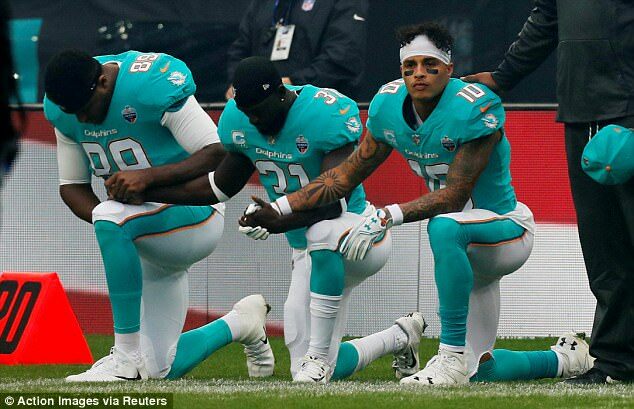 Three members of the Miami Dolphins team – Julius Thomas, Michael Thomas and Kenny Stills – were the first to take a knee during the anthem ahead of their team’s game against the New Orleans Saints at Wembley Stadium in London. 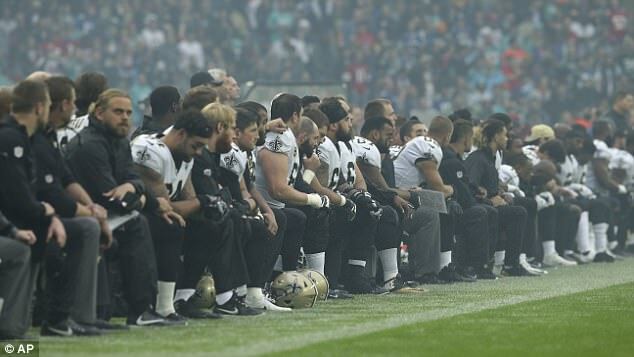 The entire New Orleans Saints roster briefly took a collective knee prior to the anthem in what quarterback Drew Brees had called ‘a way to show respect to all’. 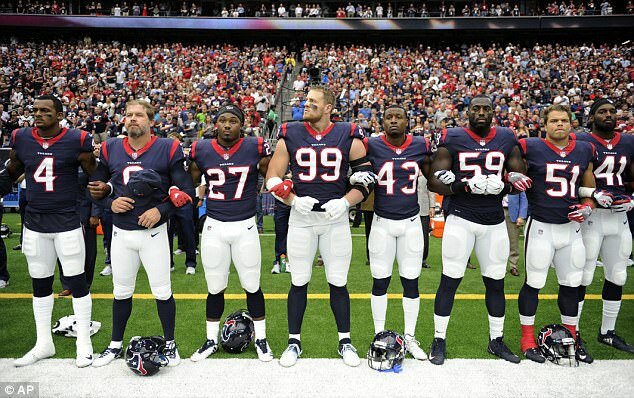 The team then stood and many linked arms. 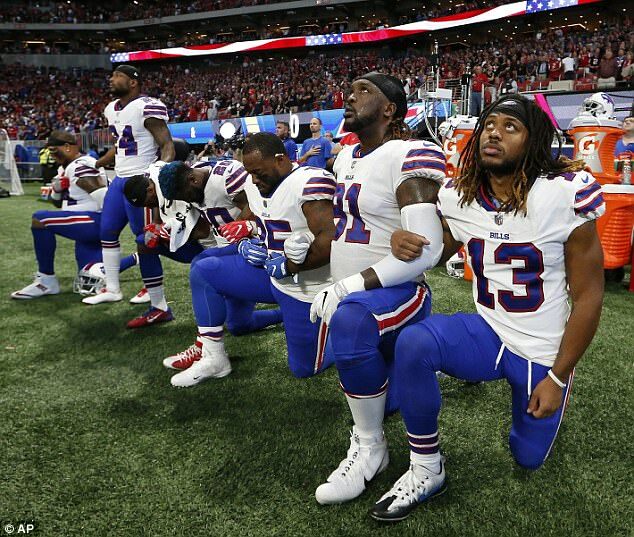 A handful of Buffalo Bills players could be seen kneeling for the anthem ahead of their game against the Atlanta Falcons. 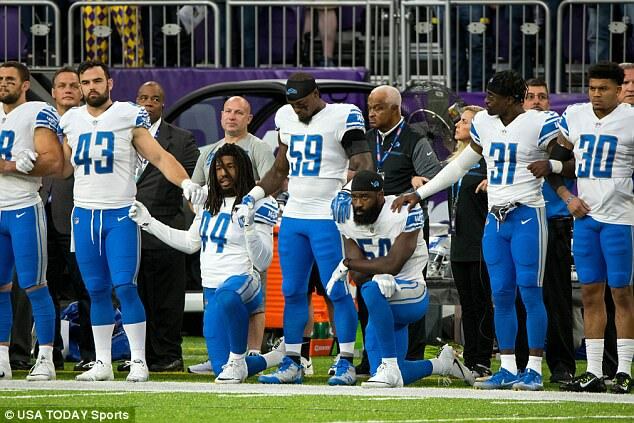 Two Detroit Lions players also took to one knee for the anthem before the game against the Minnesota Vikings in Minneapolis. 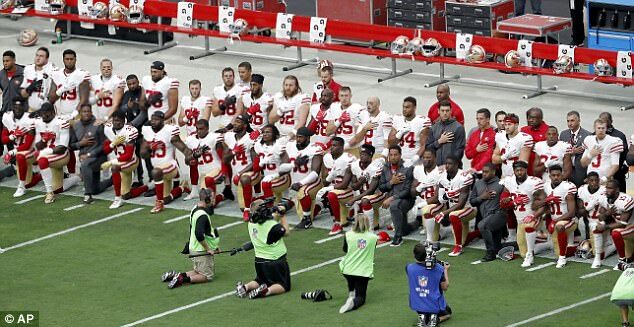 Roughly half the San Francisco 49ers took a knee prior to their game against the Arizona Cardinals. 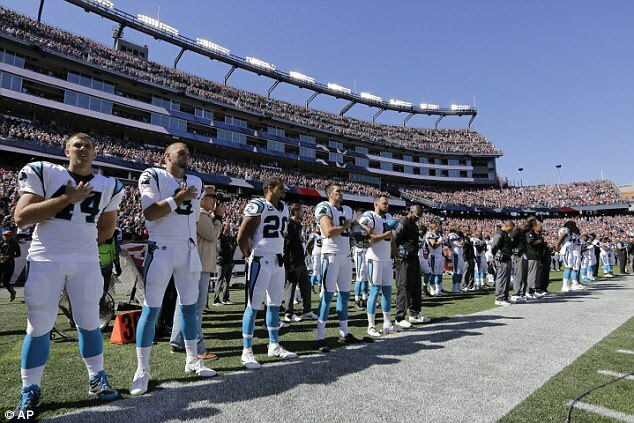 But unlike last week, there appeared to be minimal to no protests in several other games, including the New England Patriots’ clash with the Carolina Panthers and the Dallas Cowboys home game with the Los Angeles Rams. In Baltimore, Ravens fans booed their team as they took to one knee for a ‘moment of unity’ ahead of their game against Pittsburgh. Both the Ravens and the Steelers players stood for the anthem. 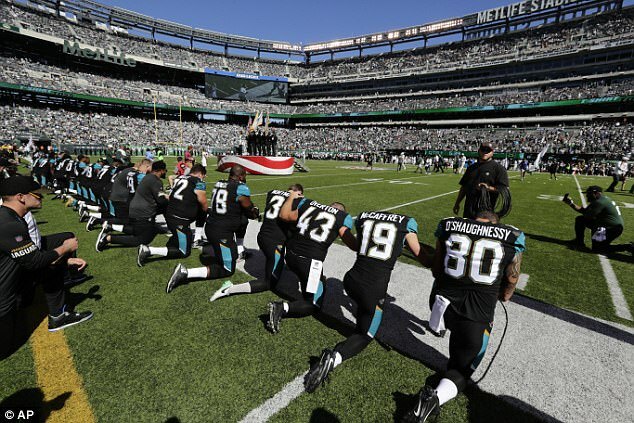 The Jacksonville Jaguars also knelt as a team but then stood for the anthem. 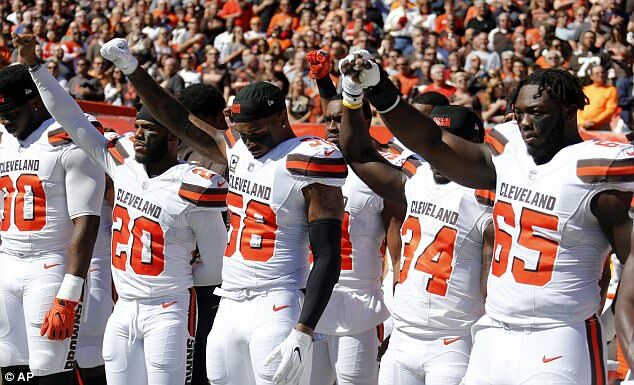 Multiple members of the Cleveland Browns raised their fists as their opponents, the Cincinnati Bengals, stood linking arms in unity. 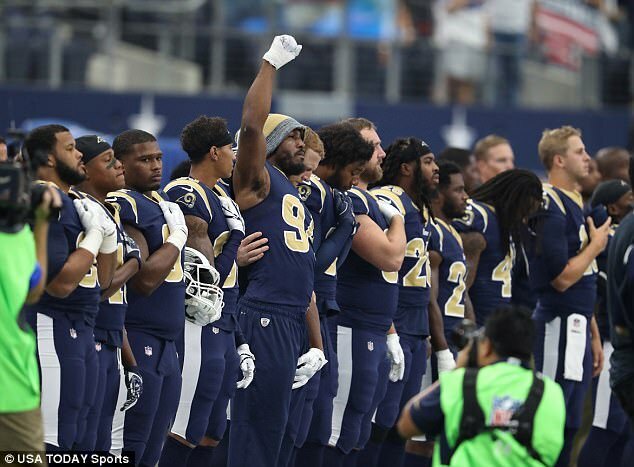 The Los Angeles Rams also linked arms as one player, Robert Quinn, raised his fist in protest. On Saturday, Trump stoked the controversy over his call for players to be fired for protesting during the anthem. 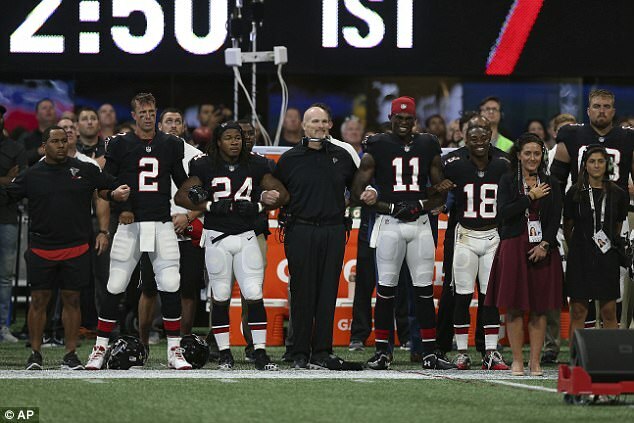 A week ago, coaches, support staff and even some owners joined team members in silent support by kneeling, linking arms or staying off the field during the anthem. 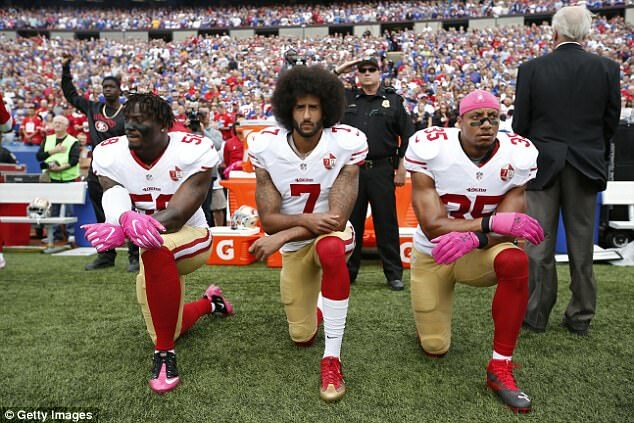 The players’ protests began last year when Colin Kaepernick, a San Francisco 49ers quarterback, protested police treatment of African-Americans by not standing during the anthem.